The majestic 18 ct yellow gold case of the DAY-DATE II originally launched in 2008 adopts a new champagne colour dial set with eight baguette-cut diamonds and two baguette-cut rubies at 6 o’clock and 9 o’clock. It also features a scintillating bezel set with 80 baguette-cut diamonds. The brilliance of precious stones and the glistening lustre of polished gold interact to give this bold and distinctive piece all the nobility it deserves. The 18 ct yellow gold of the DAY-DATE II’s OYSTER case and the PRESIDENT bracelet is alloyed by Rolex in its own foundry before being shaped in the brand’s workshops. Its unique lustre is the result of the extreme care with which it is shaped, machined and finally polished. The DAY-DATE II’s 41 mm OYSTER case, guaranteed waterproof to a depth of 100 metres (330 feet), is a paragon of elegance. The characteristically shaped middle case is crafted from a solid block of 18 ct gold. The fluted case back is hermetically screwed down with a special tool exclusive to Rolex watchmakers. The winding crown, fitted with the patented TWINLOCK double waterproofness system, screws down securely against the case. 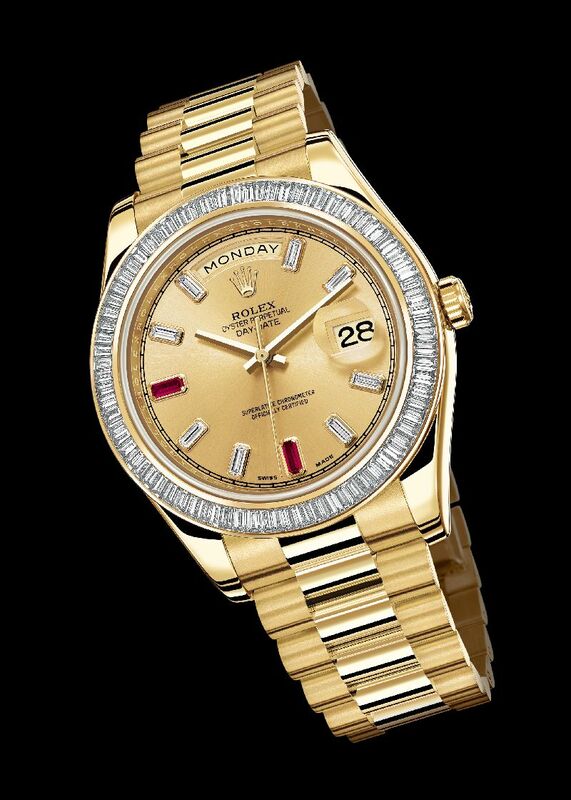 The crystal, with a CYCLOPS lens at 3 o’clock for easy reading of the date, is made of virtually scratchproof synthetic sapphire. The waterproof OYSTER case allies refinement with efficiency in protecting the DAY-DATE II’s high-precision movement. The DAY-DATE II is equipped with calibre 3156, a self-winding mechanical movement entirely developed and manufactured by Rolex. Like all PERPETUAL movements, the 3156 is a certified Swiss chronometer, a designation reserved for high-precision watches that have successfully passed the Swiss Official Chronometer Testing Institute (COSC) tests. Its architecture, like that of all OYSTER watch movements, makes it singularly precise and reliable. The oscillator, the true heart of the watch, has a blue PARACHROM hairspring patented and manufactured by Rolex in an exclusive alloy. Insensitive to magnetic fields, the PARACHROM hairspring offers great stability when exposed to temperature variations and remains up to 10 times more precise than a traditional hairspring in case of shocks. The oscillator is fitted between high performance PARAFLEX shock absorbers, patented by Rolex, which offer 50 per cent greater resistance to shocks. This DAY-DATE II model is fitted with the PRESIDENT bracelet in 18 ct yellow gold with a concealed folding CROWNCLASP. This prestigious and elegant bracelet with solid semi-circular links provides unique comfort and contributes fully to the aesthetics of the watch.